In the areas we service and live, there is always a possibility of a severe power outage, especially when it is the storm season. Generator installation in your home or business you alleviate the pains of being non-operational, left in the literal dark, and stuck with expensive bills from electric items which were ‘fried’ by the latest power surge. 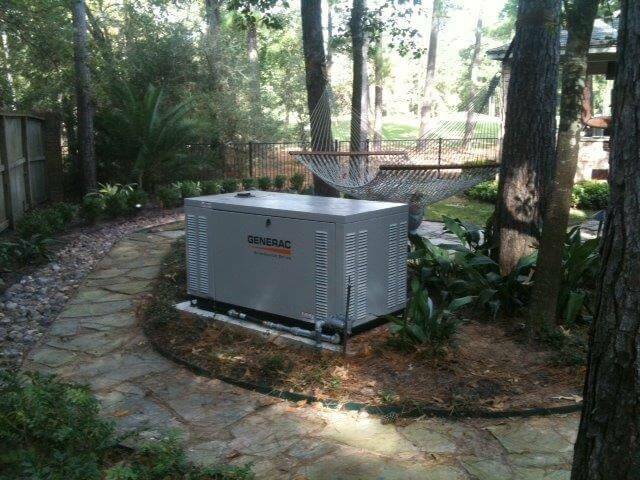 Our ARK Generator Services power consultants will be happy to help you determine the best spot to place or to locate your whole-house generator on the property. There are more factors to consider than just the aesthetics of the unit. Some factors in standby generator placement will include suggested manufacturer specifications, the location of the other utility lines around your home, and of course city or town guidelines. Often, home owners are desiring to hide the unit hidden behind landscaping or some fencing. This may or may not be the correct placement for a whole-house generator installation, when all other factors are concerned. Each power unit must be properly spaced and secured according to the manufacturer’s installation guidelines and have the access for regular generator maintenance as required by the manufacturer and the local authorities. The unit will need to be placed on a solid secure surface, usually a concrete pad. At ARK Generator Services, we will make as many visits as necessary in order to get your system up and running. For new customers, please keep in mind that there are stages of preparation and installation, which will usually require several visits, assessments, and inspections by city officials. This is for your own safety, and to ensure that your system is installed according to the highest standards and code compliances. A licensed power consultant will return to guide you through the operation and use of your generator, and answer any questions that you may have. Using the National Electrical code, we determine proper generator size. Then we begin consulting with you regarding different gas or electric generator upgrades for optimal performance in your home, business, or organization. These steps are critical because a generator which is too small can produce lowered voltage and overuse of fuel. If your home is in the building stages, we will be glad to work with your homebuilder in finding and installing the best home generator, best backup generator or best standby generator your new house. We are absolutely code compliant, and will take care of required generator placement permits. Where needed, we will have utility lines marked to assure a code compliant installation adhering to the highest standards in service and residential or commercial generator products. Our professional staff of licensed electricians and power consultants provide all the parts and service for any residential electrical or commercial electrical projects. Our licensed electricians and factory trained generator power consultants uphold a standard of integrity and superior workmanship in order to provide products and services that are top rated. With each generator installation, we take care of every detail – all natural gas piping, flex fuel lines, and other materials, which may be necessary for the strongest efficiency of your system.